Can you see the telltale Easter Egg dye on the sides? In my defense–my totally excellent babysitter was inspired to dye Easter Eggs with the kids Saturday. On the plus side: Now I don’t have to do it! On the well this is kind of a benefit side: a fridge FULL of hard-boiled eggs. The good kind, the kind that come from a local farm. Three dozen of ’em, because Holly is way, way nicer than I am. When they were showing off their work to me, we dropped one of Lily’s. And, for reasons that were never clear to me (a hungry babysitter’s boyfriend, perhaps?) 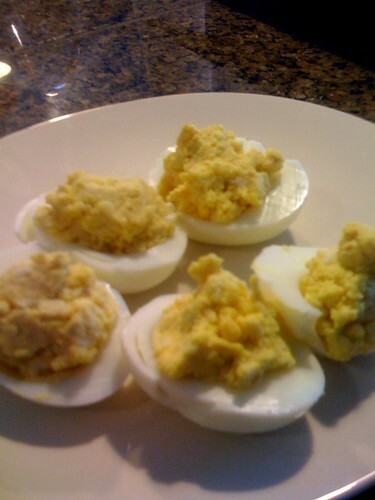 Both Sam and Wy had only 11 colored eggs–but each had one hard-boiled, but undyed, egg in their carton. Now, I don’t know what all that says to you, but to me it says lunch. And on Sunday, the Easter Bunny will have the munchies. That’s my story, and I’m sticking with it.